Saskatchewan covers 651,036 km comprising 6.5% of Canada. Saskatchewan was settled by indigenous peoples as soon as the glaciers retreated roughly 11,000 years ago. Saskatchewan includes four ecozones: prairie, the boreal transition, boreal forest and taiga. Our province is home to at least seven First Nations and six Treaties are meant to guide our relationships on the shared lands, signed 1871 – 1906. Initial European contact began with the fur trade (1690 – 1820) and this contact increased dramatically when Saskatchewan became a province in 1905. Saskatchewan’s diverse landscapes, its indigenous cultures, and the historical developments since settlement by a largely agrarian European population provide spectacular experiences for today’s visitors from both inside and outside our province. Data showed that 52% of tourism expenditures in Saskatchewan came from Saskatchewan residents. My thoughts on fostering a sustainable and high-quality visitor experience in Saskatchewan and a promising future for all people in the province are as follows. Saskatchewan has many spectacular attractions for visitors that enable recreation, learning and personal growth. Attractions include the sand hills of Lake Athabasca, fishing in northern lakes, Prince Albert Park, Wanuskewin Heritage Park, the Western Development and Royal Saskatchewan museums, the T.rex Discovery Centre at East End, Grasslands Park and the Cypress Hills to name a few. These attractions have well deserved support from people and various levels of government. The ‘big attractions’ create a multiplier effect beyond user fees, by supporting a host of tourism-related activities in the local and provincial transportation and services sectors. The small attractions created by enterprising people in the ‘shadows’ of the bigger attractions, are not always the credit they are due. What kinds of support do these initiatives need? Advertising costs can be crippling for small tourism operations. Here, Grasslands Park attracts many visitors and Bluff Creek Ranch expands the local options that are available to those visitors. The Bluff Creek Ranch advertises primarily locally, to reach visitors that are already there to see the Park. On the other hand, Bluff Creek Ranch provides access to remote areas of the park via horseback, not otherwise available to most visitors. Both support one another. Bluff Creek Ranch has guided visitors ranging from U of S university classes to visitors from Japan. These visitors found the landscape impressive and moving. The landscapes in Saskatchewan are impressive, and too often taken for granted. The landscape alone is valuable and provides value. This should be considered in planning and resource use, as in protecting the ‘view-shed,’ for example. Louise Popescul mentions the value of historic sites and local museums. These local treasures should not be ignored. Often relatively minor investments by local people, and local, regional and provincial governments can multiply the benefit of such investment. All levels of government and regulatory agencies should consider that small operations can nonetheless provide great value. Small operations should not only be respected but fostered and given considerations that can facilitate their success. For instance, an excessive permit cost was evident in a small tourism operation where the owner transported visitors in a small bus no more than 30 km from the base. The permits required by the province for this small operation were the same as if the owner were operating a bus company operating across Canada (Personal Observation). This and similar administrative insensitivity can be crippling to small operations. The above suggestion is not to say that there should be no regulation, but that regulation should be smart, reflect broad rather than narrow interests and be helpful rather than exercise undue command and control. For an example of inadequate regulation, an expansion in the outfitting and hunt farm industry was lead largely by the agriculture department in the provincial government. There was inadequate attention by Cabinet to environmental protection. There was an enormous expansion in guiding and bait pile hunting, and rearing of game on hunt farms. The tourism operators were inadequately trained for the challenges they faced. It lead to a necessary adjustment in the guiding industry and many bankruptcies among hunt and velvet/farms. The damage was North-America wide and introduced a serious disease into North American deer and elk. Efforts to reverse the spread failed. Data suggest that the disease (Chronic Wasting Disease) was not present in the wild before. It is now widespread and a great risk to wildlife and some risk to people. Mismanagement and loss of a multiplier effect: The PFRA Community Pastures. Canada’s Community Pasture Program was a world class initiative that provided an impressive range of benefits from land restored and diversification on family farms. It also satisfied some of Canada’s obligations within the United Nations. The “…total annual value of private and public benefits derived from PFRA pastures is far greater than the total annual operating costs of the Community Pasture Program.” When this pasture program was unwisely abandoned its replacement by Saskatchewan continued to provide some, albeit reduced, benefits to ranchers. Many additional benefits such as recreation and heritage values remain lost. Both the velvet/hunt farm and the PFRA pasture dilemma are attributable to one government department making decisions that reached far beyond the departments’ administrative strengths. Overall, the important values that arise from tourism, both from experiences that Saskatchewan people seek on their own and the business-type of tourism, are deeply connected in our land, in nature, our society and our institutions. Perceptive and cooperative governance is best able to protect those values for Saskatchewan’s peoples today and tomorrow. Complex decisions should be made with corresponding input from across sectors and from a broad segment of society. SaskPower has been given the unenviable task of providing energy to the people of Saskatchewan at affordable rates, wherever people live and consistently 24/7. SaskPower has served Saskatchewan well in the sense that unlike other provinces, we’ve had no major black-outs in southern Saskatchewan. SaskPower has not been given a strong enough mandate to achieve deep energy conservation or to move more rapidly toward renewable energy. Saskatchewan’s reluctance to do so, to contemplate taking the federal Government to court, is an embarrassment for me as her citizen. Even if one adopts climate skepticism as a personal value, it is irresponsible to take whole province with it, in the face of so much urgency recognized around the world. The transition to renewables needs to be made at some point in time, the time is now. Many examples exist of paths taken by other jurisdictions. SaskPower deserves to be applauded for its net-metering program and grants to facilitate adoption. Many Saskatchewan homeowners have moved to renewable sources of their own volition, well ahead of provincial policy. 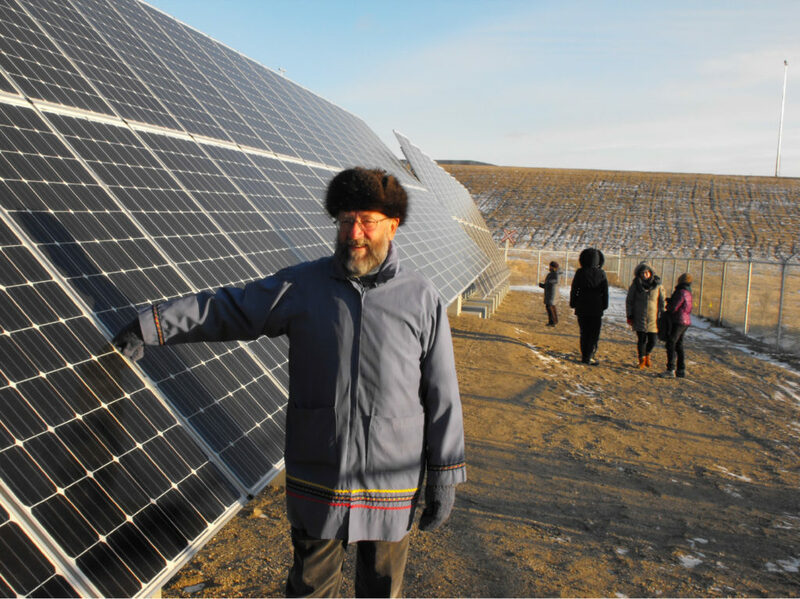 The SES Solar Co-operative Ltd. (https://sessolarcoop.wildapricot.org/ ) is an example where social capital was harnessed for progress. The Solar Co-op now has two projects already producing solar power and two more are planned. The Solar Co-op is poised to provide a promising return to its members as well as providing renewable energy. Other renewable power projects in Saskatchewan, notably the Chaplin project of Windlectric Inc., a subsidiary of Algonquin power corporation, has been rightly rejected by public opinion first and then by the Ministry of Environment. A new site for this project has been proposed by Algonquin. Needless to say, there is some opposition to it also. Wind power projects, as much as they are needed, are not benign, and neither are coal, oil & gas or hydro projects. For people living in northern Saskatchewan, power outages are an all-too-frequent occurrence. Power lines break from trees falling during storms for instance. Here also, local ownership and involvement is important. Saskatchewan’s power grid might be de-centralized encouraging local initiatives to produce the power they use in their own region. SaskPower also deserves to be applauded for allocating some of its support to community power initiatives. However, we should go much further. We should enable that every energy project, if it is not locally owned, has a portion of its investment coming from Saskatchewan. This will require an enabling institutional adjustment and advising the people of Saskatchewan of this opportunity. Several of the above recommendations involve the need for broad-based decision making in Saskatchewan, for putting the common good first and sharing the power of decision making. There are examples where our levels of government involve experts at academic or other institutions in decision making. This is most often directed at technical solutions where research is invited. Saskatchewan has many bright people in educational institutions. These people should be invited not merely for product know how but management and governance know how. Social science and socioeconomic input will help let Saskatchewan be its best, as much or more so than gadgets or high-tech practices. Recent newscast addressing the social milieu in Saskatchewan have been troublesome. There are examples of overt racism, disregard for public safety and drunken driving. One gets the sense that this province, once rightly proud of its socially and common-good minded citizens, is becoming increasingly divided. Perhaps at the root of this trend is an overblown sense and misplaced entitlement, leading to carelessness in thoughts and action. For an example, some calls exist in Saskatchewan for payments to land owners for the ecological services that belong to all of us and require all of our care. “If people in the city want clean water,” a statement might go, “they have to pay for it.” These dichotomies are troublesome, city vs country, land owner vs non-landowner. What is the logical extension to this kind of thinking? Will we need to pay for air next? Will we pay people for driving on the right side of the road? One can only speculate where and how these harmful sentiments arose. I for one would like to hear an explanation from social scientists, philosophers and from perceptive Saskatchewan elders of any culture. I would also like to hear their suggestions for a way forward. If any of the above suggestions require support from my taxes, so be it. I can buy gadgets on my own, but I cannot buy a healthy environment, an esthetically pleasing landscape or a tolerant citizenry on my own. These are goals that we need to support jointly and we need to provide the money required. Saskatchewan is too great a province not to let it grow forward and not to let it be the best it can be. Canadian Plains Research Center. (2005). “The Encyclopedia of Saskatchewan: A living legacy.” University of Regina, Regina, Saskatchewan; 1072 pp. Fung, K.-i., Bill Barry and Michael Wilson, Eds. (1999). “Atlas of Saskatchewan.” University of Saskatchewan, Saskatoon, SK. ; 336 pp. Schmutz, J. K., Allen Patkau, Ken Belcher, Renny W. Grilz, Peter E. Joyce, Wade and Louise Popescul, Kerry Holderness (2007). “Value and Preservation of Ecological Services of the Northern Great Plains.” Pp. 131-186 in Robert Warnock, David Gauthier, Josef Schmutz, Allen Patkau, Patrick Fargey and Michael Schellenberg, Editors. 2007. Homes on the range: Conservation in working prairie landscapes. Proceedings of the 8th Prairie Conservation and Endangered Species Workshop, Regina, SK. Canadian Co-operative Wildlife Health Centre (2003). “International Chronic Wasting Disease Workshop.” August 15, Canadian Co-operative Wildlife Health Centre and Saskatchewan Department of Environment, University of Saskatchewan, Saskatoon. Cross, B. (2007). “Hunters spend big bucks in Saskatchewan.” The Western Producer: 33. Kulshreshtha, S. N., and George G. Pearson (2006). “Determination of a cost recovery framework and fee schedule format for the Agriculture and Agri-Food Canada – Prairie Farm Rehabilitation Administration community pasture program.” Unpubl. Report, Dept. of Agricultural Economics, Univ. of Saskatchewan, Saskatoon. Kulshreshtha, S., George Pearson, Brant Kirychuk and Rick Gaube (2008). “Distribution of public and private benefits on federally managed community pastures in Canada.” Rangelands: 3-11. Monk, S. (2012). “Death of the PFRA: Destroying Canada’s “Greatest success story.” Cowboy Country Magazine, October/November, p. 31-35. Dolter, B. (2016). “A Response to Saskatchewan’s Climate change white paper.” Canadian Centre for Policy Alternatives: October, 20 pages. Holtz, S. (2013). “Redirecting anti-wind energy: Individuals, communities and politicians can turn a debate stalemate into an opportunity for collaboration.” Alternatives Journal 39(5): 44-47.